These 5 strict MUSCLE UP progressions are designed to drill proper repetitive movement patterns and torso leveraging whilst developing strength and flexibility throughout the wrist, forearms, shoulders and core of an athlete. A muscle up is a base level gymnastic move in which a person hangs at full extension below either gymnastic rings, or a pull up bar, and proceeds to pull themselves up as high as possible. They then leverage their torso forward enough to shift their elbows above their hands propping themselves into a low dip support. Pressing themselves up to full extension atop the rings or bar finishes the movement. When performed from a static hang it is called a strict muscle up. Another version, the kipping muscle up, utilises momentum from swinging the body to create lateral energy, which elevates the body’s center of mass vertically allowing for a more weightless transition to the support position. Both versions of the muscle up have become extremely desirable exercise movements within the functional fitness community. Though considered a potent training stimulus, muscle ups have their share of physical hazards such as strained elbow tendons, compromised shoulder joints, torn bicep tendons and strained pectoral muscles to name a few. These are mostly due to the dynamic and ballistic nature of kipping muscle ups, but are also caused by immature skill progression, paired with impatient athletes who want it all too soon. 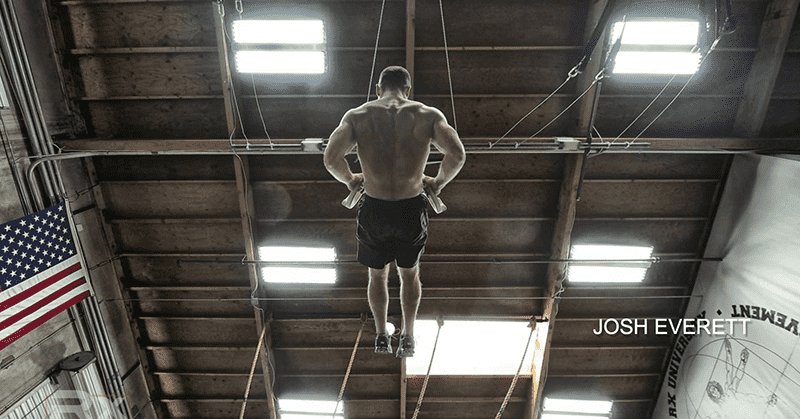 Proper preparation and development of a safe, consistent, strict muscle up before diving into kipping muscle ups is your best preventative measure to all the dangers just described. Plus, it’s just plain common sense and smart progressive coaching. The following standardised strict muscle up progressions centre around performing the full body movement rather than broken down components. The goal of these progressions is to be used as a compliment to (and not in replacement of) the traditionally prescribed strength exercises such as strict pull ups, ring rows and ring dips. The first protocol is to develop ring support confidence and stability in both the low dip support and top dip support positions. Have your athlete get into low dip support on a set of low rings cueing them to press their thumb knuckles into their ribs while resting their shoulders on top of the rings. This eliminates airspace between the rings and the torso and allows the body to act as a stabilizer for the rings to brace against. Once locked in, the coach should attempt to push, pull and separate the rings from the athlete’s body. Gradually increase the force against the rings to really challenge the athlete. Follow up with the same drills while the athlete is in top dip support while still on low rings. Cue the athlete to again press their thumb knuckles against their thighs eliminating any airspace between rings and body. The athlete’s elbows should be locked out with shoulders activated and core tight. Once again, push, pull and separate the rings and challenge the athlete to maintain support. 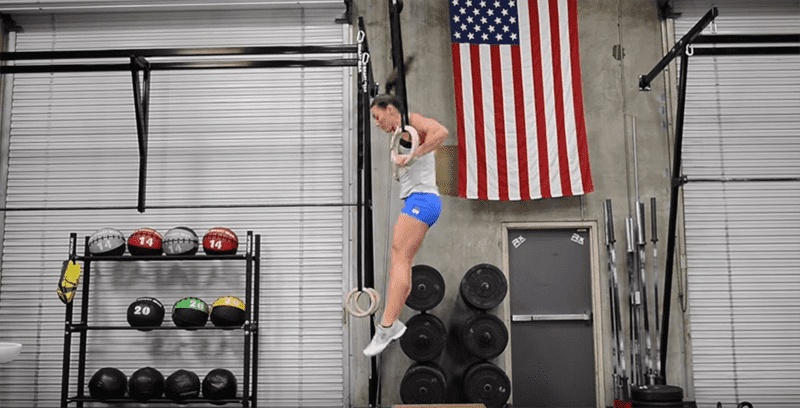 The next step is to groove the muscle up transition, which is the point where the athlete moves from hanging support below the rings to elbows above the rings holding top support. This is the critical point at which most athletes fail due to lack of strength but also lack of understanding proper torso leverage and creating lateral momentum. Cue the athlete to grasp the rings in a false grip with feet directly beneath the ring straps. Next have them squat down beneath the rings and sit directly on their heels. Tilt the upper torso back to approximately 45 degrees or less while opening the hips. Begin the pull from a straight-arm position. Important details are to keep the head neutral with eyes on the rings and knuckles facing each other and close together. Begin pulling the mid torso towards the rings until the ribs make contact focusing on keeping the shoulders behind the rings rather than directly beneath the rings during the pull phase. Once the top of the pull is reached and the transition initiates the athlete can create lateral momentum by aggressively moving their head and torso angle from about 10 o’clock position through the straps finishing at the 2 o’clock position on the other side of the straps. NOTE: Most athletes fail because their torso stops moving forward at about the straight up 12 O’clock position and they lose all momentum and leverage advantage. The next steps would be to make the drill more challenging by slowly moving the feet forward of the ring straps allowing less assistance from the feet during the transition. The final phase of this transition drill is when the athlete can perform from a sitting position on the ground with feet stretched out in front in a pike sit. The athlete would leave their feet on the ground throughout the pull phase until transitioning into low dip support on the rings. Moving onto the high rings the next drill changes the athlete’s starting position to a more vertical orientation hanging directly below the rings. Set the ring height so that the athlete can maintain a false grip with fully extended arms while feet are still flat on the ground. Next, place a 20 inch plyo box directly behind the athlete. Now the athlete begins their pull in the same manner as when performing the previous transition drill on low rings. This time the athlete must consciously move their shoulders from beneath the rings to behind the rings during the pull to get the torso into the 10 O’clock position. The athlete should use assistance from the feet during the transition by adding a little push off, then driving their head and torso forward through the ring straps to the 2 O’clock position. The athlete’s feet should leave the box when they reach low dip support. The athlete can then press out to top of dip support to complete the move. Have the athlete perform approximately 3 sets of 3 to 5 reps to help groove the pull to transition dynamic. Restricting the athlete to use only one foot on the box for assistance can make this drill more challenging. The next phase would be to raise the rings so that the athlete is starting from a fully suspended dead hang with one foot on the box for assistance. Finally we move onto the Rx Smart Rings with band assistance. This allows the athlete to hang at full suspension utilising band assistance to help them through the transition phase. We recommend starting with two green medium bands looped together. Then attach either end of the band to the D ring clips hanging from below the rings. Have the athlete step off a small box placing both feet in the middle of the bands. Cue the athlete to keep their feet directly beneath the rings and begin doing some light bounce pulls to feel the tension of the bands. Once they are comfortable have them perform 3 bounce pulls then pull right into muscle up transition shifting the torso behind the rings from the 10 O’clock position through to the 2 O’clock finishing position. Keep in mind the athlete’s feet may leave the band when pressing out to the top of dip support. 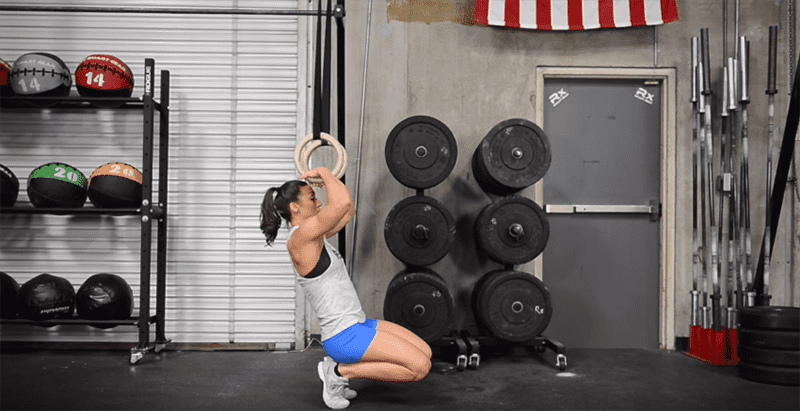 The athlete can then reverse the process by lowering to low dip support, shift their torso behind the rings when lowering down to full extension beneath the rings and repeating with a 3 bounce prep. The next progression is to reduce the number of prep bounces until only one bounce is necessary. After that, start reducing the size of the bands. Move to the thinner blue bands, then the thin red bands before finally progressing to no band assistance at all. Once the athlete begins with no band assistance they will find that performing a slight pike in the hips at the point of transition will create a counter balance effect while moving the torso laterally from behind to in front of the rings. 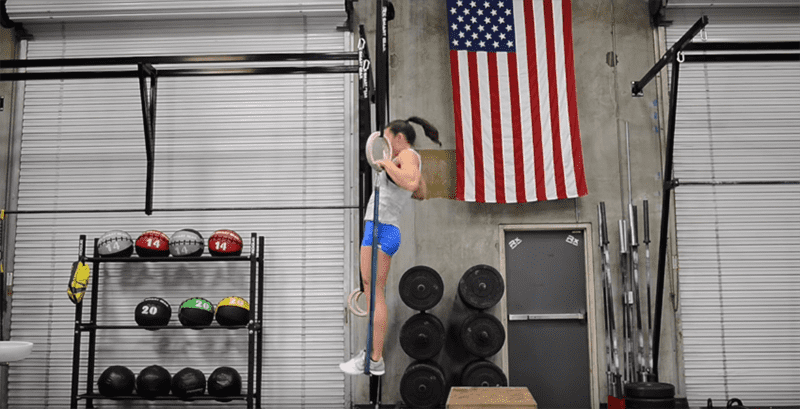 This strict muscle up progression is designed to drill proper repetitive movement patterns while developing strength and flexibility in the stabilizer muscles throughout the wrist, forearms, shoulders and core. All the while training the athlete to understand and utilize efficient torso leveraging to perform strict muscle ups. Once the athlete has mastered strict muscle ups they will enjoy a very fast learning curve transitioning to the kipping muscle up. Keep in mind the athlete can practice ring kipping and swinging drills at the same time as practicing the strict muscle up progression. That will allow the athlete to have a functionally sound kip swing by the time they learn their strict muscle up. The final step will be to link the two skills together. The moral of this story: slow down to muscle up.